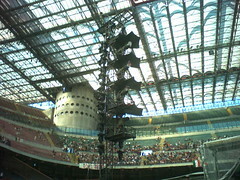 Matthias once again sends us images and words from inside the stadium in Milan. He has asked a technician on site about the lights during the show last night, which appeared to be so much darker than usual. The tech confirmed this and said it’s only 15-20% of the normal intensity, to make screens, band and audience all evenly lit for the filming.